QUICK…HELP FOR MOMS with KIDS 2-12! This 7-week session is designed to help Moms to have peaceful fun-filled times with your family. 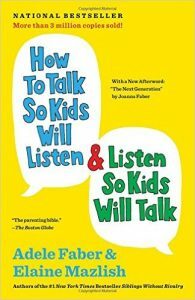 The goal of the How To Talk So Kids Will Listen Workshop is to give you practical effective methods of communication that will help make your family time less stressful and more rewarding for everyone! Groups are limited to 10 or less. Date & Time: This group meets weekly. Feel FREE to call me with a question or for more information at (714) 751-3370.